The Tigers are heavy favorites for a national championship run, for good reason. Despite this, every team from Clemson and Alabama to the smallest colleges have to play their regular season on the field and earn their chance at a championship. Starting the preview by looking at the schedule helps visualize what Clemson must do on the field from September until December. Most fans eyes will glance over the home date at Furman and focus on the primetime matchup against Jimbo Fisher’s Aggies. Woe to the fan who overlooks the home opener, especially an in state FCS program that is on the rise. Clay Hendrix’s Furman Paladins dropped three straight before winning eight out of their next ten to finish 8-5 and 25 in the FCS Coaches rankings. Previously at Air Force, Coach Hendrix installed Air Force’s unique take on the flex bone that is intermingled with other offensive schemes: think of a more diverse, adaptable version of Georgia Tech. After Furman, the Tigers head to Kyle Field in a ‘reunion’ of familiar foes between Coach Swinney and Coach Fisher. Texas A&M completed its fall from grace of the Johnny Manziel days last year by blowing a 34 point lead in the fourth quarter against UCLA. They never recovered and Coach Sumlin was fired after they finished 7-5. Kyle Field is just as loud as Death Valley, and the Aggies are a talented bunch – Jimbo’s knowledge of Clemson will help the Aggies gameplay, but his system is quite different from what the Aggies players are used to. Expect a tough fight that will come down to the wire. Like Furman, Georgia Southern is not an opponent to take a breather against. They also run the flex bone – but in its more traditional variant a la Georgia Tech since Paul Johnson coached Georgia Southern to multiple national titles at the FCS level. The Eagles are not as potent as they used to be due to a period of turmoil following their transition to FBS, but they are a formidable and young opponent conveniently scheduled the week before Georgia Tech. Every year, pundits claim its Paul Johnson’s last year at Georgia Tech. Every year, he returns for another year torturing the ACC at a snail’s pace. 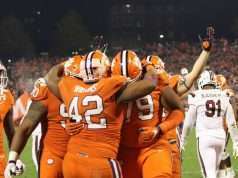 The good news for Clemson is that since the arrival of Brent Venables the Tigers have managed to stifle their unique offense at a rate other teams would dream of achieving. Even with that in mind, this year’s results cannot last on last year’s laurels. Facing Syracuse the week after Georgia Tech is as drastic a change as possible in schematics in college football as the Orange come to town with their version of the Art Briles offense. Clemson will pay extra attention to Syracuse this year, but Syracuse will be improved and knows how to beat Clemson. This is a major year for Wake Forest, and Clemson playing at their house stands out as a trap game. While Wake Forest is not the most talented program, they are a ‘dark horse’ pick to win the Coastal division and should not be overlooked by the fans. After a bye week, NC State returns to Clemson with bad blood after a close loss last year amid a controversy surrounding laptops and trash being thrown on the field. The Wolfpack lost numerous important players, but star quarterback Ryan Finely returns for a final campaign. Expect this to be more hostile than a normal conference game. In the long run, losing Jimbo Fisher and hiring Willie Taggart was a blessing in disguise for FSU. Those around the program have not-so-subtly called out Fisher’s culture and raved enthusiastically about Taggart. Taggart knows Florida and will install a scheme and a culture that will match with FSU long term. 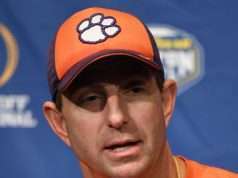 They will be a powerhouse again sooner rather than later, and this could be a top ten matchup in Doak Campbell where Clemson has won once in Coach Swinney’s tenure and twice in the past twenty five years. Louisville is far less intimidating since Lamar Jackson left, and the Tigers have the home field advantage this year. Louisville recruits primarily three star players and without a generational talent to elevate the team, this may lack the star power of previous matchups. 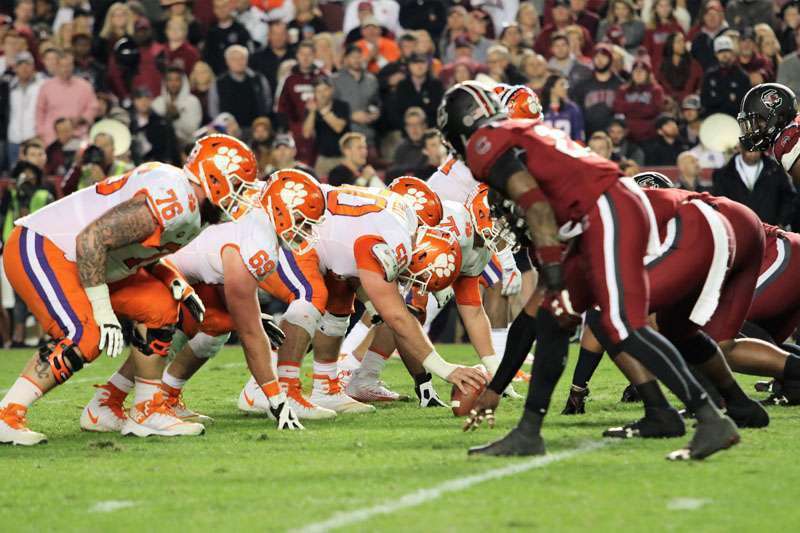 Playing Boston College late in the year is not to Clemson’s advantage – let alone in Boston. The Eagles are always the most physical team the Tigers play, and the long trip to Boston in the cold will exacerbate matters. This is the textbook definition of a trap game. 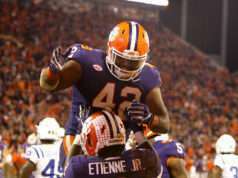 Consistent with the theme of smaller opponents that are formidable, Clemson returns home to honor Veterans Day and face off against the Duke Blue Devils. Coach Cutcliffe is an incredible coach and quarterback Daniel Jones is an excellent player – two ingredients needed for an upset. The problem for Duke is their offensive line projects to be horrendous – a weakness Clemson could exploit to dominate the game. While all of the games are equally important in the race to the title, the South Carolina game means more with bragging rights and the state championship on the line. South Carolina is an improving program that should do well this year – and in rivalry games the underdogs have an advantage as everything is thrown out the window. This is the game every fan circles on the schedule no matter how good or bad either team is – but it takes eleven games to get there.